The following is a press release from Thermal Energy Partners dated June 17, 2016,Â regarding the status of the Nevis Geothermal Project. 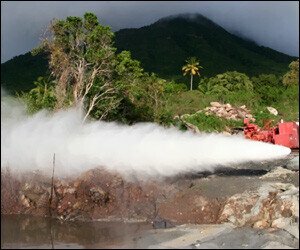 “The coordination of the final design element of the geothermal ORC plant is important for the future production of geothermal power here in Nevis. Our visit this week keeps progress on schedule and we are on-track to have a fully completed geothermal plant by the end of 2017 that will generate electric power from a high enthalpy geothermal resource”Â, said Bruce Cutright, CEO of Thermal Energy Partners. Deputy Premier of Nevis Hon. Mark Brantley stated, “Nevis” has a commitment to achieving our climate change goals that includes significantly cutting energy costs to our citizens and to transitioning our Island to a totally independent renewable energy source. We will soon be able to produce zero-emission electricity and export geothermal power to nearby islandsÃ¢â‚¬Â. Thermal Energy Partners, Turboden, Clemessy and its Nevisian partners represent a trans-formative team that is setting the standard for creating an entirely green economy with substantial economic benefits for the Island and for the region.